Just when you thought Hello Kitty toys couldn’t get weirder, along comes a Hello Kitty toy with a see-through stomach and a collection of visible internal organs. Designed by Dr Romanelli in collaboration with Saniro and Medicom, biology gets a Hello Kitty touch too. Instead of looking like they sort urine from blood or perform those other tasks that organs do, Hello Kitty’s organs are sort of cute, in co-ordinated shades of lilac and they smile too. I wouldn’t like to think that this was the only tool given to children for understanding the biology of the human body. Otherwise we’ll have a generation growing up thinking that livers have eyes and hair ribbons. Yet i suppose it’s a good way of introducing kids to the general idea of internal organs, or of pleasing slightly weird adults by giving a Frankensteiny twist to Japanese cute. 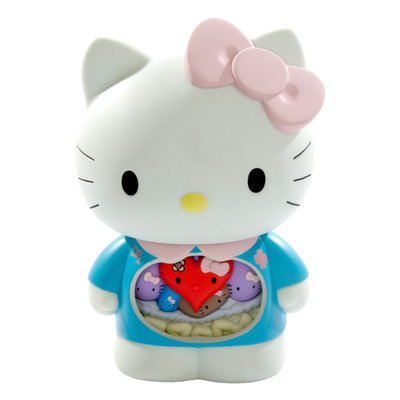 It is exactly the right toy for people who always wondered what Hello Kitty looks like on the inside.